"Personalized playing cards” and custom playing cards have been aggressively used by brand managers to get the eyeballs on their logos, products, services etc. We have made quantities as low as 2000 personalized playing card packs to as many as a million packs (even more) for a promotion. Almost every industry that sells a product can use this as a very effective promotional tool. From airlines that make playing cards for the passengers, with the airline logo, liquor companies depicting the brands on the playing cards, hotels industry showing different room pictures on the playing card fronts, to the pharmaceutical companies that make playing cards as a giveaway to the doctors through their sales reps....we have made them all. 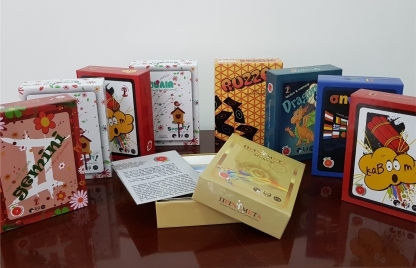 And the low cost involved in popularizing your products and services through personalized playing cards as medium has also been effectively utilized by the small businesses as well. We make playing cards for groceries, general stores, dry-clean shops, draperies and departmental stores to name a few. It’s quite cost effective and gets the eyeballs on your product. People love to play with cards and you will find your deck with them for a long time. Every house has a deck of cards and putting your brand on a personalized playing card deck will help popularize your product. "Promotional playing cards" can be made with your design and art work requirements. 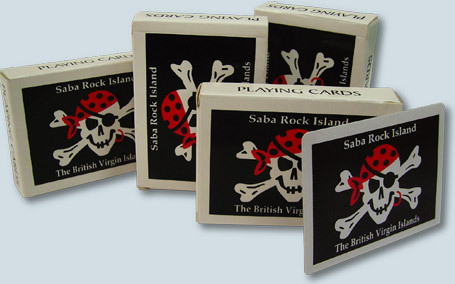 Playing card fronts can have your designs and the playing card backs can be printed to your specifications. Your choice of colors. Even your choice of cards per deck if you need insertion. Tuck box shall also be personalized as per your design and specifications. Again, 14 PT C2S German playing card stock is standard for all the personalized playing card decks. We will print any number of decks above 2000 to your exact specifications and artwork requirements. Even the card size and the shape of these playing cards can be altered as per your requirements. The fronts can have 13 different designs or all 54 if required. You can place normal pips or colorful pictures on the fronts at no additional charge. Personalized playing Cards have been used by multinationals to show their products and services in detail. Our clients say that they find personalized playing cards a great way to promote their services in a way that really works. Playing cards can be made to be a convenient size that fits easily in your hand, back pocket or jacket pocket. Playing cards are unique and different, which gets them noticed more and always realises an interesting comment from the receiver. Most of all they are memorable. Your clients will always comment on the playing cards they have received in the past and best of all they still use them. Promotional Playing cards are always better than the brochure because everyone has a pack of cards somewhere. If they receive a new pack they are not going to throw them away as they are always useful. You can use personalized playing cards for an ongoing promotion. It’s the answer to “How to tempt customers into buying more of your products”. You will find personalized decks inside cartons of liquor bottles. You will find promotional packs inside crates of juices. You will find personalized playing cards coming with pizza boxes. We use European playing card stocks for all personalized playing cards. 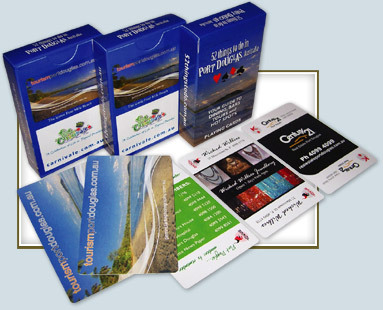 Most of the promotional playing cards are printed on gloss coated card stocks. You may take matt finish or low gloss to very high gloss with our propriety easy slip finish. Here you can choose between matt finish with very dull gloss aqueous coating to medium gloss aqueous coating that is used on casino playing cards, to high gloss done through UV coating process. All personalized playing cards shall have our propriety high slip for easy flow of cards in hand.